Along with millions of television viewers around the globe, Andy Warhol witnessed the devastating events surrounding the assassination of President John F. Kennedy unfold through mass media outlets. Newspapers and TV broadcasts became saturated with images of Jackie Kennedy both on the morning of November 22, 1963, moments before JFK was shot, and in mourning, following his death. The assassination of JFK marked the first time in history when a national disaster would be played on an endless televisual loop around the globe. Jackie, 1964, is a tightly cropped painting, depicting a photograph from the inauguration of President Lyndon B. Johnson on Air Force One, just hours after JFK was shot. An immaculately poised Jackie stood beside President Johnson, still in her blood soaked clothes, and served as a symbol of grief for the nation. In his essay, ‘Saturday Disasters: Trace and Reference in Early Warhol’, art historian Thomas Crow described Jackie as ‘a kind of history painting’. Like the great history paintings of the nineteenth century which depicted scenes of historical importance, Jackie represents a pivotal moment in American history. Executed in a somber cerulean blue background, Jackie elicits the devastating, somber mood of the nation in the aftermath of Kennedy’s assassination. The present work shows Jackie in up-close profile, with her head lowered in shock and disbelief. Warhol was riveted by the sequence of events immediately after the assassination and the burial the days following. He was fascinated with the media coverage of the assassination and the portrayal of Jackie, as both a martyr and media goddess. As the artist’s friend and biographer, David Bourdon, writes: “By cropping in on Mrs. Kennedy’s face, Warhol emphasized the heavy emotional toll during those tragic closing days in November. The so-called Jackie Portraits, far from displaying any indifference on Warhol’s part to the assassination, clearly reveal how struck he was by her courage during the ordeal” (D. Bourdon, Warhol, New York, 1989, p. 181). Jackie was executed at the heart of Warhol’s Death and Disaster series; this unconventional series illustrated how the repetition, even of gruesome devastating images, could “empty” the image of its meaning. Jackie is a by-product of how the media saturated these gruesome and despairing images daily. Warhol extracted the ubiquitous images that flooded mass media and cropped them to be void of any context or background. He created an entire series of images of Jackie that were published in newspapers and magazines and consumed as a cultural phenomenon. He illustrates the imagery of the First Lady fulfilling her responsibilities as a public figure through this catastrophe. Poet John Giorno recalls visiting Warhol at home that day: “We sat on the couch watching the live TV coverage from Dallas. Then we started hugging, pressing our bodies together, and trembling. I started crying and Andy started crying. Hugging each other, weeping big fat tears” (J. Giorno, quoted by V. Brokis, Warhol, 1989). Gallerist and patron Ileana Sonnabend (née Schapira) stands as one of the most influential and provocative figures of the recent art historical canon. From her early childhood interests to her marriages and subsequent collaborations with Leo Castelli and Michael Sonnabend, her life revolved around championing art and artists—particularly works that challenged the status quo. The Castellis presided over the conversations and debates that shaped the art world in New York, eventually opening a gallery in the sitting room of their Manhattan residence in 1957. Ileana came to be known for her connoisseurial eye and artistic judgement, and the Castellis’ sphere of influence included such figures as Willem and Elaine de Kooning, Jackson Pollock, Lee Krasner, Franz Kline, Robert Rauschenberg, Harold Rosenberg and Sidney Janis. Following her divorce, Ileana married Michael Sonnabend, an erudite scholar and writer, and opened Galerie Sonnabend in Paris. After setting the European cultural scene ablaze with their fearless shows of American Pop art, they returned to New York, opening the Sonnabend Gallery in the same building as Leo Castelli. Like so many prescient collectors before them, Ileana and Michael Sonnabend embraced the controversial and ‘difficult’ works now considered masterpieces of post-war and contemporary art. Encompassing major works of painting, sculpture, drawing and prints from a diverse range of masters, their collection was the natural outcome of a lifetime spent with artists. The Sonnabends’ collection, much of which passed through inheritance to Ileana’s daughter, Nina Castelli Sundell, was so vast that it was regularly lent to museums across the United States and Europe. It remains one of the 20th century’s greatest assemblages of fine art, one that is indelibly linked to the fascinating personal history and connoisseurial vision of Ileana Sonnabend. This painting was exhibited in 2005 at the Gagosian Gallery in New York and was dedicated to paintings, sculptures and works on paper by Andy Warhol from the collection of Ileana Sonnabend. A renowned gallerist and dedicated art collector, Sonnabend was an early and fervent supporter of Warhol and presented three important exhibitions of his work at her Paris gallery, where she showed the series Death and Disasters (1964), Flowers (1965), and Thirteen Most Wanted Men (1967). 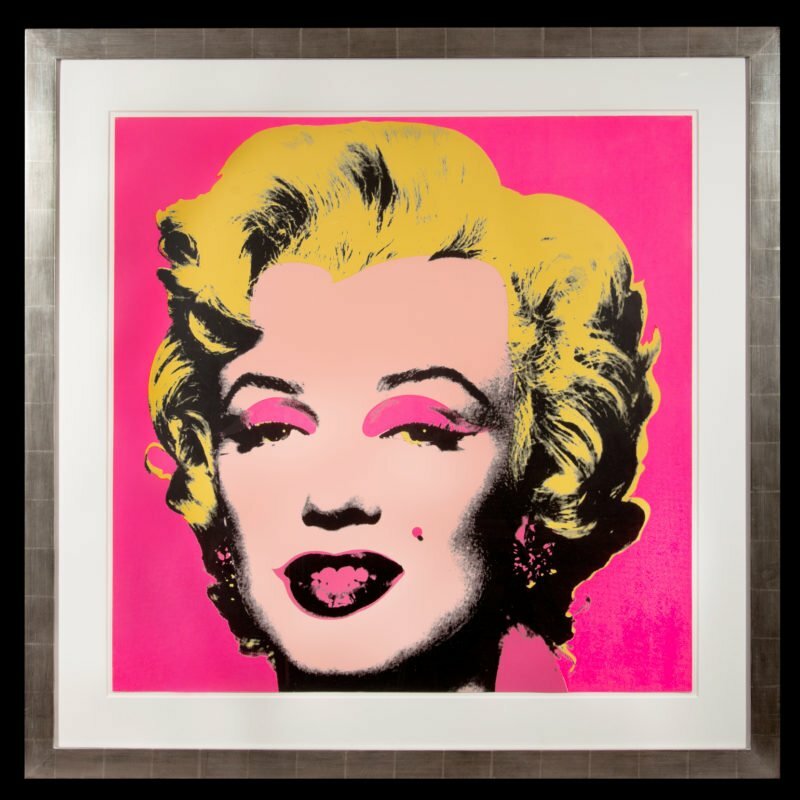 During this time she assembled a private collection of seminal works, acquired directly from Warhol’s studio at the time of their making. All but three of the works in the Gagosian Gallery exhibition dated from the critical years 1962 to 1965. New York, Tony Shafrazi Gallery, Andy Warhol Portraits, May-October 2005. New York, Gagosian Gallery, Warhol from the Sonnabend Collection, January-February 2009, p. 77 (illustrated in colour). Warhol studied pictorial design at the Carnegie Institute of Technology, Pittsburgh, from 1945 to 1949. He moved to New York in 1949 and worked as a commercial artist. Club Medal for his shoe advertisements 1957.
the electric chair, flowers and so on, sometimes with rows of repeated images.